Users of Project Online (or SharePoint w/ Project Server) are long accustomed to publishing their plan on the web for others to view, change, or otherwise manipulate project plan data. This convenience is beneficial for plan authors, team members, and stakeholders alike, for the obvious reason of having the plan online for all to view as needed. But, what if you are using the standalone version of Microsoft Project, either in its most recent incarnation (MS Project 2016) or going back as far as MS Project 2007? Sending out the native .mpp file and hoping the recipient has a copy of MS Project on hand (or has access to a viewer app). None of these methods are ideal for a team member in the field, armed with only a web browser at a cyber cafe or holding a smartphone / tablet while on the job. The ideal situation would be to publish your plan to the web, where all that’s needed is a web browser. This article describes two innovative ways to put your project plans out on the web – with a minimal of fuss, but with a maximum amount of function – for any collaborator armed only with a simple web browser. The first option discussed is one that takes your work breakdown structure and displays that – for a minimum of confusion and a maximum amount of understanding. The second option publishes your plan just as you see it in MS Project and allows an online reader to manipulate the data in many of the same ways that you do. This option is for those that want to display the design of a plan and allow the reader to be “walked through” what the plan will accomplish. Here we employ MindJet’s MindManager, which many of you may already be using, by creating your work breakdown structures within. The latest version of this handy planning tool (version 2018) includes publishing to the web in just a few clicks, and it’s free of charge (albeit the app does cost south of $350 USD). When installed, Mindjet inserts an add-in to your MS Project setup, and that allows the web magic to happen. Simply click Send to MindManager while in MS Project (or just use your WBS created in MindManager) and you are just a few more clicks away from a published plan on the web for all given a shared link to view. What you get with this option is a hyper-animated walkthrough of your plan – something that not even the all-mighty MS Project Server can do. This option is for showing other team members or stakeholders what you see in your plan while using MS Project. It’s for when you know the folks out there might not have a copy of MS Project handy or they are using a tablets and smartphones on the job. This option will cost you (and your plan readers) either nothing at all or $19.99 a year, depending on the functionality desired. The procedure is simple: share your MS Project plan in .mpp format to any of the popular file-sharing cloud sites such as Dropbox, Box, Google Drive, OneDrive, etc., and then have your intended audience open the file from the Project Viewer 365 Website. Step 2. Ba Boom! Now that the file is open, your intended audience can navigate around your plan just as if they were a MS Project user themselves, only they are doing this traversal using a web browser and nothing else. Some caveats apply. 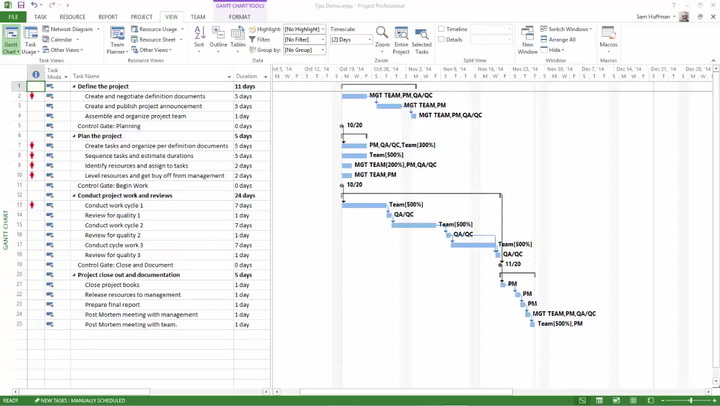 With the free online viewer, users can use only the Gantt Chart, Task Sheet, and Resource Sheet views. Other views are restricted to the paid viewer or the editor version, which is also available as a subscription service. For more on using this product, see this article on MPUG.com. You just learned two unique ways of publishing your plan to the web – useful if you don’t have another way, such as the expensive MS Project Server or the pay-per-day MS Project Online. Both options described get your plan to any audience sporting a web browser, regardless of the device being used. Using the MindManager option, you can walk users through a high-level breakdown of your plan, which may get your message across better than a Gantt can. Using the Project Viewer 365 option, you can publish your plan to web by allowing users to open the native .mpp file without having MS Project installed. Your audience will be viewing your plan as if using MS Project without the heavy weight of loading all that bloat. As we’ve seen, caveats apply to both options: you may have to spend some bucks, depending on which you choose, but you won’t spend as much as you would if you went out and hired a web developer for the purpose of publishing your plans. One last note with both of these options: information security could be an issue, as your data is out there in the wild, but for the willing, this may not be a concern. For those of you brave enough to try, go ahead and post your results and/or comments below. See this article on MPUG.com for details on that! Thanks Jigs! Enjoy your posts. Some practical, doable options to going full blown web based collaboration. Once again Jigs knocks it out of the park with a solution that could benefit a large percentage of small businesses that have “plans” for growth, NGOs (thinking disaster relief organizations), and smaller government agencies. @ John, thx! I wish someone would tell me what my BA is…always a good metric 🙂 It’s true what you say about the small NGO or agency… they really like to keep it simple (and cheap). — The 365 Free viewer was sweet info! –I would have to say the mind mapping solution is highly recommended as I have had some project team members that did not like Gantt Charts but loved Mind Maps. Throwing in the 2018 update info was awesome! Count me in as a Jigs fan!